Horner's Penny Stories for the People..
28 large format 16pp penny stories in two columns with illus. Stapled in printed wraps, except where stated. ¶45. L., M.E. 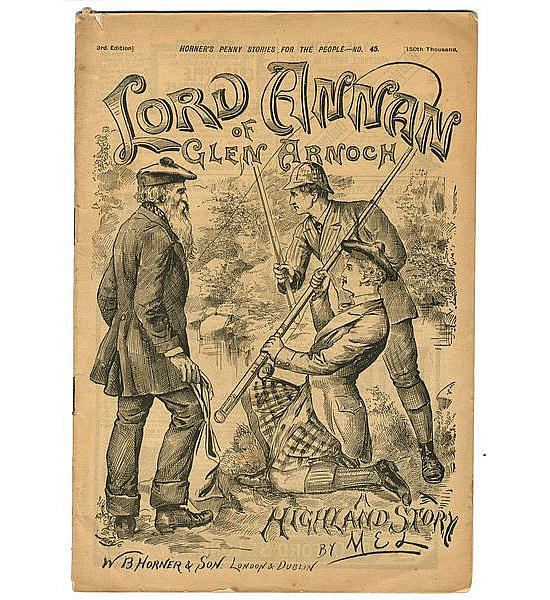 Lord Annan of Glen Arnoch. A Highland story. 3rd edn. 150th thousand. Cream wraps; sl. spotted. [c.1891]. 78. Watson, Sydney. Played out. 4th edn. 200th thousand. Beige wraps; sl. chipped. [c.1892] 79. L., M.E. Winnie&apos;s hero. 5th edn. 250th thousand. Green wraps; sl. browned. [c.1892]. 83. Pettman, Grace. The Waif of Trelagan. 4th edn. 200th thousand. Green wraps; browned. [c.1892]. 84. Eden, Fannie. The Winning of Beulah. 8th edn. 400th thousand. Green wraps; marked & sl. sunned. [c.1892]. 91. Searchfield, Emilie. Until Seventy Times Seven. A farmer&apos;s daughter&apos;s story. 250th thousand. Orange wraps; text browned. [c.1893]. 103. (Pettman, Grace) That Mysterious Telegram. Disbound with wraps, marked with minor alterations for a later edition. [c.1892]. 114. Pettman, Grace. Reaping the Whirlwind. Without wraps; first two leaves torn with loss of a few words. [c.1892]. 138. Watson, Sydney. Jack Stunsail&apos;s Legacy. 3rd edn. 150th thousand. Grey wraps; spotted with minor tears. [c.1892]. 147. Eden, Fannie. John Wentworth&apos;s Tenant. (Pt 2 of no. 145.) 5th edn. 250th thousand. Green wraps; spotted, corner torn. [c.1894]. 182. Pettman, Grace. My Laddie. 400 thousand. Green wraps; split at spine, marked with cuts for a later edition. . 184. Pettman, Grace. Roland Hardwicke&apos;s Reaping. Grey front wrap; marked with cuts for a later edition. [1896?] 197. Pettman, Grace. Into the Depths. Without wraps. [c.1897?]. 287. Pettman, Grace. Only a Gipsy Boy. Without wraps. With a few corrections. [1899?]. *Containing a ms. note from the Author to the Editor about a later edition. 295. Reynolds, Bessie. The Taming of Elspeth. 3rd edn. Cream wraps; damp marked with sm. tears at spine. [c.1898]. 333. Pettman, Grace. Gathered Threads. Without wraps. [1900?]. 978. Hodgkinson, Florence. Jess o&apos; the Potbank (serial). Cream wraps; sl. torn, tear from pp 7-8 affecting a few words. *With a note by the author on "Two Wrongs and a Right" that it is "for Christian novels". 1912. 1238. Blake, Stacey. The Love Trail (serial). Cream wraps; sl. torn. June 9th, 1917. 1280. Pettman, Grace. When Love Was Conqueror, &c. Orig. cream wraps. March 30th, 1918. *Now Horner&apos;s Penny Stories and Woman&apos;s Own. A voucher copy. War-time price 1½d. 1299. Pettman, Grace. Love Among the Roses. Cream wraps; dusted. August 10th, 1918. *War-time price 2d, and 2d from now on. 1358. Pettman, Grace. The Way of a Maid, &c. Cream wraps; one marginal tear affecting a few letters, marked & dusted. September 27th, 1919. 1451. Pettman, Grace. Since I Knew You. Cream wraps; staples rusting. Marked Duplicate. July 9th, 1921. 1467. Pettman, Grace. Hearts Adrift, &c. Cream wraps; sl. marked. October 29th, 1921. 1520. Pettman, Grace. When John Proposed, &c. Cream wraps; sl. marked, staples rusted. Novebmer 4th, 1922. 1529. Pettman, Grace. A New Year Bride. Cream wraps; sl. marked, staples rusting. January 6th, 1923. 1786. Pettman, Grace. Up With the Mistletoe. Christmas number. Cream wraps; rust marks. December 17th, 1927.